This time of year I always get the spring cleaning bug. The house feels dusty and stuffy from the winter months, but it's still not warm enough to open the windows and air things out. I feel an overwhelming need to shake out all those cozy blankets, fluff the pillows on the couch, wash things I don't normally wash like curtains and baseboards - and let's just not even talk about the state the windows are in after this season's storms. As we have been transitioning to a more simple, natural, and purposeful lifestyle, I have been purging my cleaning supplies. I use a bottle up, throw it out, and exchange it for a "cleaner" option. I started buying natural cleaning products from the store, but I am slowly transitioning out of that as well for two reasons. One, because those products aren't actually as safe and chemical-free as I thought they were. And two, because I discovered that it is incredibly easy and inexpensive to make my own household cleaner! I have been making my own concoction for almost a year now and I will never go back. It's completely safe and chemical-free. That means family-friendly, pet-friendly, and environment-friendly. It kills germs and yucky bacteria. That's right, it actually cleans and disinfects. It cuts through grease, soap scum, and water spots. It doesn't leave a weird film on the surfaces you clean. Use it on counters, showers, tubs, sinks, door handles, remotes, etc. It takes less than a minute to make. LESS THAN 60 SECONDS, MY FRIEND. That's faster than you can run to the store to pick up another bottle of regular household cleaner. Ok, now that I've talked it up and made it sound so good, I'm going to give you the recipe so you can try it out for yourself! Just add a few squirts of castile soap to your glass spray bottle, then the water, and finally the essential oils of your choosing (I like lemon & orange for their powerful sanitizing properties, as well as the Young Living Purification & Thieves blends. They are great at disinfecting and cleaning surfaces, and they make the house smell great!). Twist on the lid and shake to mix it all up and you're in business. THAT'S IT. To use, spray on a surface that needs cleaning and wipe down with a rag or small towel. 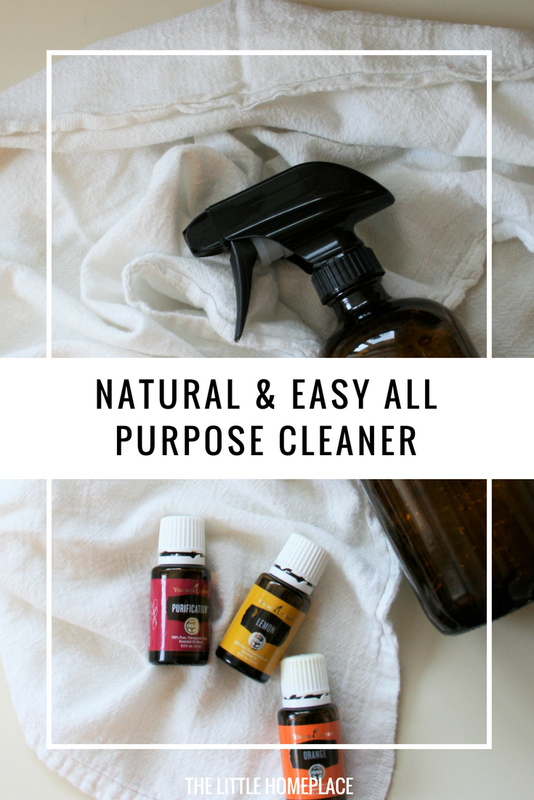 Would you like to see more posts on the all-natural, minimalist cleaning products I use? Comment below and let me know!